"The film was made at Jeonwonsa Film Co." The Cinema Guild has released the official US trailer for the latest film, titled Hotel by the River, made by acclaimed, beloved Korean filmmaker Hong Sang-soo, who keeps making new films pretty much non-stop all the time. This first premiered at the Locarno Film Festival last summer, where it won the Best Actor prize, and later went on to play at the Toronto and New York Film Festivals last fall. This B&W drama is set in the dead of winter; a poet invites his sons to join him at a hotel for a reunion. The hotel also hosts a newly single woman who has a friend keep her company. The poet is drawn to the beautiful girls and cannot resist the temptation to discover more. Their lives intersect, connect and disconnect and potentially become a metaphor for modern life. Starring Ki Joo-Bong, Kim Min-hee, Kwon Hae-hyo, Song Seon-mi, and Yoo Joon-Sang. 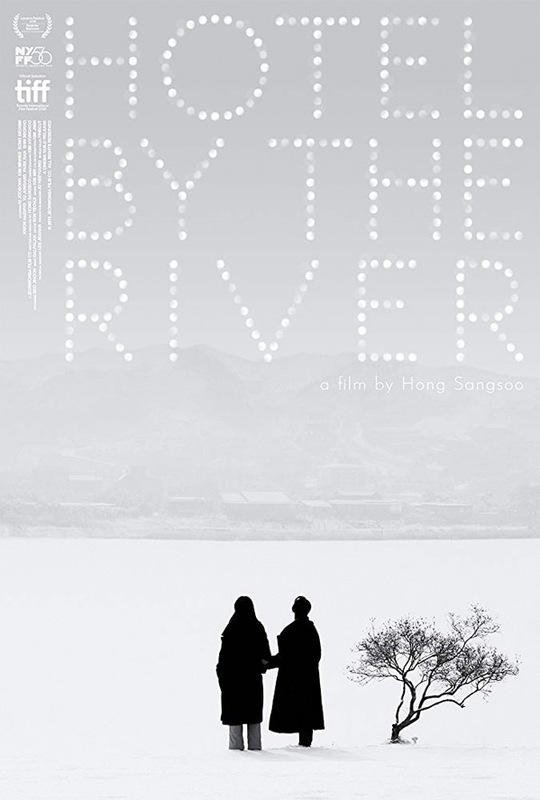 This looks like another mesmerizing, bleak, contemplative film from Hong Sang-soo. And I love the official poster they made - check it out below. Two tales intersect at a riverside hotel: an elderly poet (Ki Joo-bong), invited to stay there for free by the owner, summons his two estranged sons, sensing his life drawing to a close; and a young woman (Kim Min-hee) nursing a recently broken heart is visited by a friend who tries to console her. At times these threads overlap, at others they run tantalizingly close to each other. Using a stark black-and-white palette and handheld cinematography (with frequent DP Kim Hyungkoo), Hong crafts an affecting examination of family, mortality, and the ways in which we attempt to heal wounds old and fresh. Hotel by the River, also known as Gangbyeon Hotel, is both written and directed by acclaimed Korean filmmaker Hong Sang-soo, also known as "the Woody Allen of Korea", of many films previously including Woman on the Beach, Lost in the Mountains, The Day He Arrives, In Another Country, Hill of Freedom, Right Now Wrong Then, Claire's Camera, On the Beach at Night Alone, and The Day After. This premiered at the Locarno, Toronto, and New York Film Festivals last year. The Cinema Guild will release Hong Sang-soo's Hotel by the River in New York starting on February 15th next month, then in Los Angeles on March 8th. How does that look?